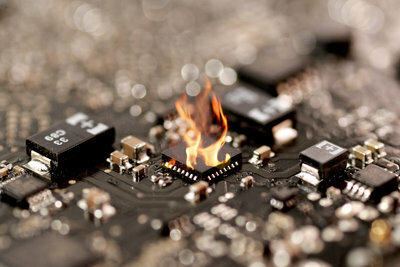 A thermal runaway is an increasing threat to electronic devices where more and more power is packed in ever smaller spaces; it is a threat that is poorly dealt with using traditional means. SMD thermal fuses offer a solution that can be reflow-soldered at 260°C and still open at 210°C. What is meant by a thermal runaway or the thermal damage of power semiconductors: A thermal runaway refers to the overheating of a technical apparatus due to a self-reinforcing process that generates heat. This damage usually causes the destruction of the apparatus and often leads to a fire or explosion. The causes of a thermal runaway are varied and often random in nature. However, the ever-higher power density in electronic wiring and the trend towards miniaturization are without a doubt of particular importance. More and more functions are packed in compact modules, which then also have a correspondingly high power consumption. Even slightly excessive currents in power electronics with only a little power loss lead to elevated temperatures of approximately 200°C. The possible consequences: damage or disconnection of surrounding components, damage to the printed circuit board structure or, in the worst case, the triggering of a fire. With a power semiconductor (e.g. MOSFET) the drain-source transmission resistance increases with rising temperatures, when connected, which results in an increasing loss of power in the barrier layer. If the elements are not sufficiently cooled - the high power density permits cooling - the power loss output in the form of heat can no longer be sufficiently dissipated, which also increases the transmission resistance. This process escalates and ultimately leads to destruction of the component. SCHURTER develops and manufactures SMD thermal fuses with the lowest possible internal resistance for power electronics of the highest packing density. They can be reflow-soldered at a maximum temperature of 260°C without opening. The temperature trigger is therefore around 210°C during operation. This corresponds to a range above normal component temperature ratings, but still below the limit to create serious consequences, The fuse opens with or without current flow depending on the temperature. Such irreversible thermal fuses are resistant to mechanical shock, vibration, thermal shock, temperature cycles and moisture. They are qualified according to AEC-Q200. Yes, a thermal runaway is a threat that is poorly dealt with using traditional means. It is such a good information that the products available for the assembly of an SMD printed circuit board are too complicated or completely unsuitable as well. Thanks and keep up the great work!